The 42-story, red-brick, mixed-use tower known as One Carnegie Hill has rental apartments in its lower half and condominium apartments in the top. The new tower incorporates a 63,000-square-foot community facility for the Islamic Cultural Center, which is on the northeast corner of 96th Street and Third Avenue. 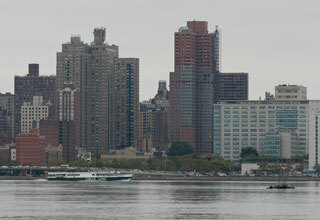 One Carnegie Hill and Circle Line boat. 9 October 2005.